BBC drama led record demand for the iPlayer, with crime drama McMafia receiving over 3 million requests. 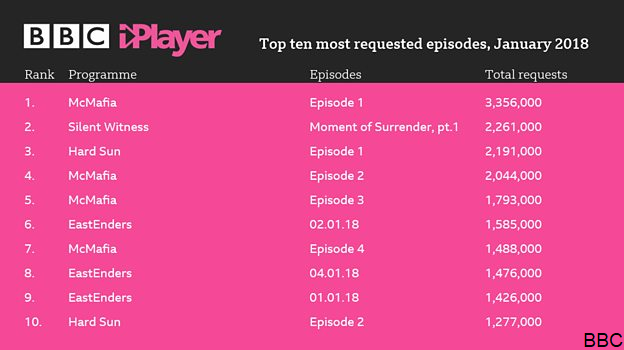 BBC One's Silent Witness and Hard Sun, along with other episodes of McMafia featured in the iPlayer Top 10 covering January 2018, according to new statistics released today. Hard Sun was made available to watch on BBC iPlayer as a boxset after the first episode aired, and the first three episodes of the series all made the top 20 most-popular episodes of the month. New Year episodes of BBC One soap EastEnders also made the top 10. Wildlife series Big Cats attracted around 1 million requests per episode, but fell just short of appearing in the top 10. According to the BBC, the first month of 2018 was also the best month on record for BBC iPlayer, building on a strong December to reach a record-high 328 million requests across the month, a 10% increase on the same month last year. There was a record average of 10.6m daily requests for TV content in January, and requests from TV devices reached a record-high proportion of 54%. The profile of BBC iPlayer users has evened out over time, now slightly skewing towards women. It remains strongly under-55 in terms of age, which is younger than the typical TV viewer’s profile (although more in line with home broadband users). "2018 has got off to a flying start, thanks in no small part to a range of gripping BBC dramas. McMafia, Hard Sun and Silent Witness dominate our most popular programmes on iPlayer for January, as does the always strong-performing EastEnders. It was also impressive to see the wildlife series Big Cats make this month’s top 5 performing series with an average of over 1 million requests per episode. It’s been a great start to the year, and we’re aiming to build on that success in the coming months."